Branch membership of a few hundred in the first two decades rose rapidly following World War II, reaching a peak of approximately 1500 in the 1950’s. It is significant to note that several members moved up from branch Executive position to higher office with Provincial Command. Two of these achieved noteworthy positions. Mr. Justice Mervyn Woods rose to Provincial President (1955-57) followed by election to Dominion President (1960-62). Gordon Blair joined Branch #63 in 1948 while attending University of Saskatchewan. He practised law first in Saskatoon and then in Ottawa. He continued Legion work over the years and was Chairman of the Constitution and Laws Committee, Dominion Command (1963-84). In 1994 he was asked to become Grand President of the Royal Canadian Legion, an honour he held until his death in 2006. Membership has declined in the past 10 years due to deaths, non-renewals and now stands at under 300 including Life Members. For many years the Saskatoon Poppy campaign had its headquarters in Branch #63. The 3 local branches along with the Army, Navy, Air Force Veterans and local cadet groups have participated in the Poppy Campaign, each responsible for a particular area of the city. Since 2004 the campaign headquarters has been moved to Branch #362. The foundation for Saskatoon Branch #63 of the Royal Canadian Legion, is The Great War Veterans Association of Canada, chartered April 24, 1919. This went on to become the Canadian Legion of the British Empire Service League which was established October 23, 1926. The first president was Dr. W. A. Carrothers. The initial home of the branch was located at 4th Avenue and 21st Street. There are no buildings remaining on this corner from that time period. By 1929 membership had grown to the point where a larger building was needed. Work commenced that spring and the building at 315 – 19th Street East was opened and the first meeting was held in December 1929. An addition to the building was completed in 1972, adding a smaller hall, kitchen, boardroom and larger office. That location was in continuous use until the early part of 2007. Due to rising upkeep, utility costs and declining membership, along with a generous offer from a developer, the property was sold in early 2006. It was at this time that the current location, 606 Spadina Crescent West was purchased. A Ladies Auxiliary to the Branch was formed and the Charter received May 26, 1931. The hard work of the Auxiliary members over the years – catering, Tea and Bake sales – contributed many thousands of Dollars to the Welfare of the Branch, one highlight, for many years, a dinner was hosted for all Veterans, whether Legion members or not, in the afternoon of November 11th. The crowd filled the large upstairs hall. The afternoon concluded with the Branch Chorus leading the singing of Old Wartime Favourites. Due to declining numbers, the Ladies Auxiliary was disbanded in May 1999. May we, the members of Branch #63, be ever indebted to the Ladies Auxiliary members for their devotion and loyalty to the branch over the period of 68 years. THANK YOU LADIES FOR ALL YOUR SUPPORT. Another annual event of many years, put on by the Ladies Auxiliary was a dinner on April 9th. This was to honour all remaining Veterans of the WWI Battle for Vimy Ridge. WE WILL REMEMBER THEM!!! During the depression years (1930’s) unemployment was high. Branch Executive actively lobbied to persuade employers to give preference to unemployed veterans when hiring for the few jobs available. A male vocal chorus was formed in March 1932, with 44 members. The chorus performed many concerts over the next 32 years before it disbanded. That must have been an awesome sight, not to mention the sound. It is unfortunate, that many did not get to see or hear them. The Second World War years (1939-1945) saw the branch supporting Provincial and Dominion Command in lobbying the Federal Government to ensure adequate benefits for the returning Veterans. The branch worked with Department of Veterans Affairs to have them purchase a 200 acre parcel of land to establish a community of ½ acre small holdings (Montgomery Place) on Saskatoon’s west side for Veterans. Branch members were active in urging the Federal Government to allow the Older (WWI) Veterans to form a home defence unit, the purpose being to guard against suspected enemy aliens involved in subversive activities. NOTHING LIKE SPYING ON YOUR NEIGBOUR!!!!! The Branch also supported and promoted the war bond drives. One had to wonder how much money was put into these. 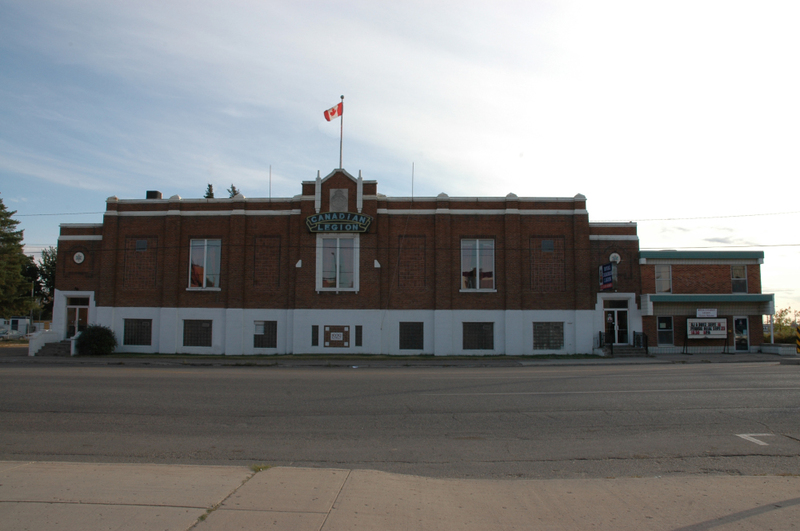 During the war years, the large dance floor in the upstairs hall was a popular place with Service Men and Women stationed in Saskatoon and area during the war. OH!! IF THOSE FLOORBOARDS COULD TALK, WHAT STORIES THEY MIGHT HAVE TO TELL. A highlight-and challenge- for the branch was hosting the 1948 Dominion Convention. Some 1900 Delegates attended.